There are of course, far fewer bass around in the Winter months, there’s no doubting that. But, if you’re going mad at the prospect of waiting until April in order to dust down the lure gear, then I implore you to get out there and give it a go! 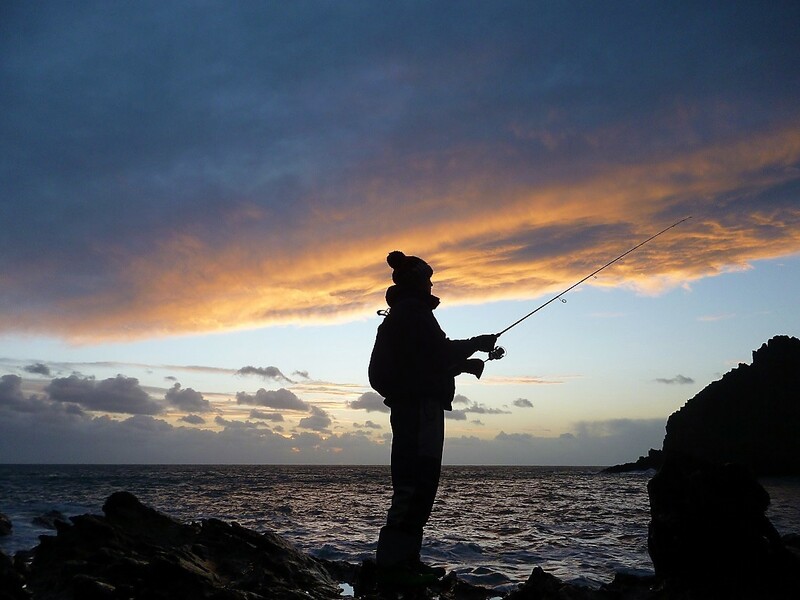 You could catch a fish of a lifetime at this time of the year, or you’ll more likely blank – but don’t take it to heart! It’s great just being out there! You can try out those new lures – test out their action, practice how to use/work them correctly, how do they look/drift in the water? You can test out those new marks – differing conditions affect how a mark will look (white water, swirling areas of current perhaps) and possibly fish – watercraft essentially. You’ll be honing all of your skills – you don’t want to be out there feeling rusty (teething problems with new gear, tangles etc) on that first session of the Spring when the bass are feeding. You’ll still be learning no matter what – As long as you’re out lure fishing, thinking about all or most of the aspects associated to it, then you’ll be learning. All of it will assist you in the future as it’s cumulative knowledge/experience. Mid December, during a relatively cold spell for South Devon (wiping frost from the windscreen) I was up and about nice and early. The good thing about fishing at dawn at this time of year is that you only need to set the alarm for 0630 rather than 0330! So with first light at around 0730 and the sea temperature still at 13 degrees, by 0700 I was pulling up at the car park in order to lure fish a very picturesque stretch of coastline… I couldn’t wait to get down there! The area I was fishing is very exposed to a Southerly through to a Westerly wind, where you’re casting from rocks onto a seabed that is 100% sand. I only started fishing it in November but it has produced some nice bass for me already (see here). The main tactic has been to ‘bounce’ articulated paddletails like the Illex Nitro Sprat and Fiiish Black Minnow or large soft plastics like the Megabass Dot Crawler or Megabass Giant Xlayers around on the bottom. The reason for fishing lures that effectively ‘hug’ the bottom is that I feel (based on previous experience) that bass are as ‘less willing’ to chase sub-surface minnow type lures in mid-water at this time of the year, than they might be in warmer conditions when the sandeels are present for instance. If the mark is really shallow, say 1 – 4 ft then I would still be comfortable using the sub-surface minnows however, I was fishing into 10 ft of water on this mark. With the tide 3 hours into the ebb, a good 6 ft swell rolling through and with the water clarity decidedly murky, I commenced the session by casting quite close into the beach where the waves were breaking. But after 30 minutes of fruitless effort, I decided a move along the rocks (out into the mouth of the cove) was required. With my previously successful session fresh in my mind (when I’d caught bass really close in, tight to the rocks) I decided that rather than whack the lure out into the middle of cove, I would concentrate on ‘working’ the Nitro Sprat very close, parallel almost to my stance. First cast into a new area – Bang! On the first cast into this ‘new’ zone just as I lifted the lure off of the seabed, a very sharp pull and a few head-shakes saw a small (1.5 lb) bass thrashing on the surface below me… fantastic! As the fish was quite small I was able to lift it out quite comfortably on my Majorcraft Skyroad (in stock here correct 14 Jan 17), before taking a quick photograph, un-hooking and returning it via a nearby sheltered gully. The very next cast saw an almost repeat performance. The only difference being that the bass had in fact taken the lure at mid-water level (maybe it had followed the lure off the bottom after all!) and it was slightly larger. I was buzzing by this stage I can tell you! However, after another hour of cast and retrieve it was time to head home for some breakfast… The bass had clearly been holding here briefly, before moving out with the tide. Late December this time on a day when it was fairly mild, cloudy and damp with light winds. The sea conditions were extremely good (still 13 degrees) with decent clarity (1 – 2 ft) and a consistent (3 -4 ft) swell ensuring there was easily enough white water present to warrant fishing a very specific (and generally consistent) mark. I had planned to fish the final hour of the ebb and the first 2 hours of the flood here. Mid January – yesterday in fact. I had a previous client with me (no money was exchanged as I was fishing today as well) who is arguably keener on his bass fishing than me! 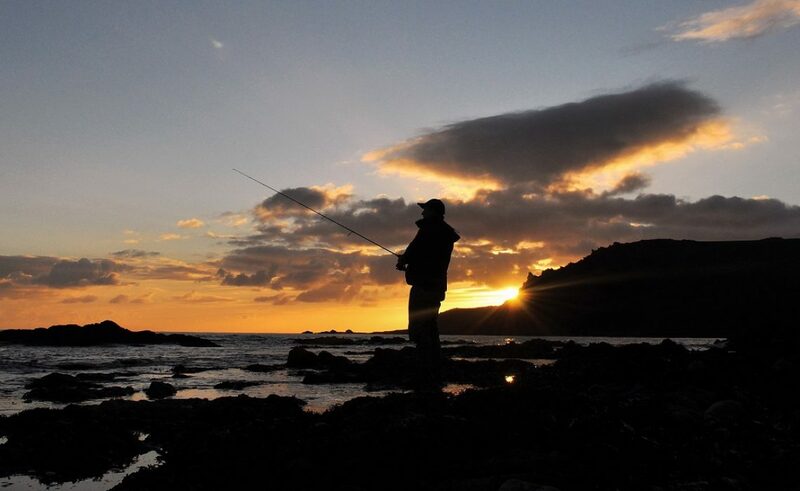 The previous evening had seen snow inland (over the moors) in South Devon but I wasn’t put off of trying to catch a bass on a lure – it was something we both wanted to attempt. We had talked about bait, but with reports of plenty of bait fish around and having witnessed gulls smashing shoals of fish 300 yards off the rocks a few days earlier, added to the fact that we wanted to remain mobile (it was very cold) we decided to stick with the lures. With a bone-chilling North-Westerly blowing through under a (very welcome) sunny sky, the choice was to either fish exposed marks with white water around them or fish in sheltered areas in the lee of the cliffs where a bit of tide was running… Eventually we decided on two separate stretches of coastline (a 30 minute car ride between the two) where we could fish a number of different types of marks over the final 3 hours of a very low (spring) tide and the first 4 hours of the flood – in total we walked 25,000 steps! The first mark we fished looked really tasty. Decent water clarity (1 ft) for the time of year, a nice 2 – 3 ft swell rolling through creating some inviting tables of surf over a shallow reef that was being exposed by the ebbing tide at an alarming rate – perfect for bass on the prowl for gobies/shrimps and the like… With a very shallow diving minnow (a Tacklehouse Feedshallow in the Ochiayuahg colour mimicking a small pollack or goby) and a weightless soft plastic (OSP Do-Live Stick) deployed on my colleagues rod we began searching the area out in a very systematic manner – to no avail. The next mark we intended to fish is quite close (500 yards) to a large estuary mouth which can often be significant depending on the amount of rainfall we’ve had in the previous 24 hours. Additionally, sea conditions here are critical, as you need a little movement in order to get the best out of it however, anymore than 4 ft of swell can render it dangerous but it’s one hell of a good bass mark in the right conditions… The sea state was spot on but the clarity was filthy (brown) due to a long ‘slick’ of flood water that was exiting the estuary and being shifted by the wind, and tide, right onto the mark – gutted was my thoughts. So a 30 minute drive ensued, extended due to the hedge cutting that was in progress (comes with the territory) whereby we arrived at a remote cliff-top car park. My companion had never seen, let alone fished this stretch of coastline which is, as he put it, ‘like the land that time forgot’… It is prehistoric almost in comparison to the high cliffs, sandy coves and pretty beaches that you associate with south Devon, but here in lies its attractiveness to me – it is amazing ground that holds bass and you hardly ever see anyone else fishing. The final mark is a bugger to climb down to! However, we were both content that as it was dry, we would attempt the climb as the conditions looked brilliant on the mark below – lovely greenish water with 18 inches of clarity, its temperature a reported 12 degress, 6 ft of swell moving through on the flooding spring tide… It literally smelt of bass! As we were casting out onto pure sand, we attached similar paddletail lures to our clips and went for it! About 20 minutes in and a shout from my left saw my colleagues lure rod nicely bent into either a rock or a fish – it was the latter! But after another 5 seconds or so, the rod straightened before I could clamber close enough to assist – Bugger! or words to that effect, it was a bass! I’d only said earlier in the day that we might only get one chance today which was part of the reason I was happy to have some company for this session – it increased the odds of catching! With the sun getting lower in the sky, the wind increasing and our feet/backs/arms aching and our freezing fingers now being damaged by casting with the braid we decided to call it a day. I have to say though, I felt strangely content with the day’s fishing! We hadn’t landed anything but we’d come pretty damn close and there were obviously bass still around, just not in any numbers. As a consolation the sunset was totally spectacular – I couldn’t fail to take a decent photograph it was that beautiful. Previous Bass fishing marks – Where do I look in winter?